Class representing a general abstraction for surface finite element interpolation class. Definition at line 44 of file feinterpol3d.h. Definition at line 47 of file feinterpol3d.h. Only basis functions that are nonzero anywhere on the boundary are given. Ordering can be obtained from giveBoundaryNodes. Boundaries are defined as the corner nodes for 1D geometries, edges for 2D geometries and surfaces for 3D geometries. answer Basis functions Array to be filled with the boundary nodes. lcoords The local coordinates (on the boundary local coordinate system). Definition at line 51 of file feinterpol3d.C. answer Array to be filled with the boundary nodes. Definition at line 46 of file feinterpol3d.C. Boundaries are defined as the corner nodes for 1D geometries, edges for 2D geometries and surfaces for 3D geometries. The determinant of the boundary transformation Jacobian. Definition at line 56 of file feinterpol3d.C. Definition at line 61 of file feinterpol3d.C. Definition at line 71 of file feinterpol3d.C. Evaluates the normal on the requested boundary. Definition at line 76 of file feinterpol3d.C. Definition at line 66 of file feinterpol3d.C. Definition at line 81 of file feinterpol3d.C. Definition at line 86 of file feinterpol3d.C. Evaluates the matrix of derivatives of edge interpolation functions (shape functions) at given point. These derivatives are in global coordinate system (where the nodal coordinates are defined). answer Contains resulting matrix of derivatives, the member at i,j position contains value of dNj/dxi. isurf Determines the surface number. lcoords Array containing (local) coordinates. Definition at line 64 of file feinterpol3d.h. Evaluates the array of edge interpolation functions (shape functions) at given point. answer Contains resulting array of evaluated interpolation functions. Definition at line 63 of file feinterpol3d.h. Evaluates the normal out of the surface at given point. answer Contains resulting normal vector. Definition at line 67 of file feinterpol3d.h. Definition at line 139 of file feinterpol3d.C. Definition at line 73 of file feinterpol3d.h. answer Contains resulting global coordinates. Definition at line 70 of file feinterpol3d.h. Definition at line 91 of file feinterpol3d.C. References oofem::IntArray::at(), computeLocalEdgeMapping(), oofem::IntArray::giveSize(), and oofem::IntArray::resize(). Implemented in oofem::FEI3dHexaQuad, oofem::FEI3dTetQuad, oofem::FEI3dTrQuad, oofem::FEI3dWedgeLin, oofem::FEI3dWedgeQuad, oofem::FEI3dTrLin, oofem::FEI3dTetLin, oofem::FEI3dHexaLin, and oofem::FEI3dLineLin. Referenced by boundaryEdgeGiveNodes(), computeEdgeMapping(), oofem::Shell7Base::edgeEvalCovarBaseVectorsAt(), oofem::Shell7BaseXFEM::edgeEvalEnrCovarBaseVectorsAt(), oofem::Shell7Base::edgeEvalInitialCovarBaseVectorsAt(), oofem::Shell7Base::edgeEvalInitialDirectorAt(), oofem::Shell7Base::setupInitialEdgeSolutionVector(), and oofem::Shell7Base::temp_computeBoundaryVectorOf(). Implemented in oofem::FEI3dHexaQuad, oofem::FEI3dTrQuad, oofem::FEI3dTetQuad, oofem::FEI3dWedgeLin, oofem::FEI3dTrLin, oofem::FEI3dWedgeQuad, oofem::FEI3dTetLin, oofem::FEI3dHexaLin, oofem::FEI3dLineLin, and oofem::FEI3dHexaTriQuad. Referenced by boundaryGiveNodes(), boundarySurfaceGiveNodes(), and computeSurfaceMapping(). Definition at line 103 of file feinterpol3d.C. References oofem::IntArray::at(), computeLocalSurfaceMapping(), oofem::IntArray::giveSize(), and oofem::IntArray::resize(). Referenced by oofem::Q27Space::computeLoadLSToLRotationMatrix(), oofem::QSpace::computeLoadLSToLRotationMatrix(), oofem::LSpace::computeLoadLSToLRotationMatrix(), and oofem::LSpace::drawTriad(). iedge Determines the edge number. Implemented in oofem::FEI3dHexaQuad, oofem::FEI3dTetQuad, oofem::FEI3dTrQuad, oofem::FEI3dWedgeLin, oofem::FEI3dTrLin, oofem::FEI3dWedgeQuad, oofem::FEI3dLineLin, oofem::FEI3dTetLin, and oofem::FEI3dHexaLin. answer Contains resulting matrix of derivatives, the member at i,j position contains value of dN_j/dxi_i. Reimplemented in oofem::FEI3dTrQuad, oofem::FEI3dTrLin, and oofem::FEI3dHexaLin. Definition at line 123 of file feinterpol3d.C. Referenced by oofem::TransportGradientDirichlet::computeXi(), oofem::Shell7Base::edgeComputeBmatrixAt(), oofem::Shell7BaseXFEM::edgeComputeEnrichedBmatrixAt(), and oofem::Shell7Base::edgeEvalInitialCovarBaseVectorsAt(). Implemented in oofem::FEI3dHexaQuad, oofem::FEI3dTetQuad, oofem::FEI3dWedgeLin, oofem::FEI3dTrQuad, oofem::FEI3dTrLin, oofem::FEI3dWedgeQuad, oofem::FEI3dLineLin, oofem::FEI3dTetLin, and oofem::FEI3dHexaLin. Referenced by boundaryEdgeEvalN(), oofem::Shell7Base::edgeComputeBmatrixAt(), oofem::Shell7BaseXFEM::edgeComputeEnrichedBmatrixAt(), oofem::Shell7BaseXFEM::edgeComputeEnrichedNmatrixAt(), oofem::Shell7Base::edgeComputeNmatrixAt(), oofem::Shell7Base::edgeEvalInitialDirectorAt(), and oofem::Shell7BaseXFEM::evaluateLevelSet(). Implemented in oofem::FEI3dHexaQuad, oofem::FEI3dTetQuad, oofem::FEI3dTrQuad, oofem::FEI3dWedgeLin, oofem::FEI3dWedgeQuad, oofem::FEI3dTrLin, oofem::FEI3dLineLin, oofem::FEI3dTetLin, and oofem::FEI3dHexaLin. Referenced by boundaryEdgeLocal2Global(), oofem::Shell7BaseXFEM::computeEnrTractionForce(), and oofem::Shell7BaseXFEM::edgeComputeEnrichedNmatrixAt(). Sets up a suitable integration rule for integrating over the requested boundary. The required polynomial order for the determinant of the jacobian is added automatically. order Polynomial order of the integrand (should NOT including determinant of jacobian). Definition at line 115 of file feinterpol3d.C. References oofem::_Line, oofem::IntegrationRule::getRequiredNumberOfIntegrationPoints(), and oofem::IntegrationRule::SetUpPointsOnLine(). Reimplemented in oofem::FEI3dHexaQuad, oofem::FEI3dTrQuad, oofem::FEI3dTetQuad, oofem::FEI3dTrLin, oofem::FEI3dWedgeLin, oofem::FEI3dWedgeQuad, oofem::FEI3dTetLin, oofem::FEI3dHexaLin, oofem::FEI3dLineLin, and oofem::FEI3dHexaTriQuad. Definition at line 195 of file feinterpol3d.h. Definition at line 48 of file feinterpol3d.h. cellgeo Cell geometry for the element. Reimplemented in oofem::FEI3dTetQuad, and oofem::FEI3dLineLin. Definition at line 40 of file feinterpol3d.C. Reimplemented in oofem::FEI3dHexaQuad, oofem::FEI3dTrQuad, oofem::FEI3dTetQuad, oofem::FEI3dTrLin, oofem::FEI3dTetLin, and oofem::FEI3dHexaLin. Definition at line 128 of file feinterpol3d.C. Referenced by oofem::SurfaceTensionBoundaryCondition::computeLoadVectorFromElement(), oofem::SurfaceTensionBoundaryCondition::computeTangentFromElement(), and oofem::TransportGradientDirichlet::computeXi(). 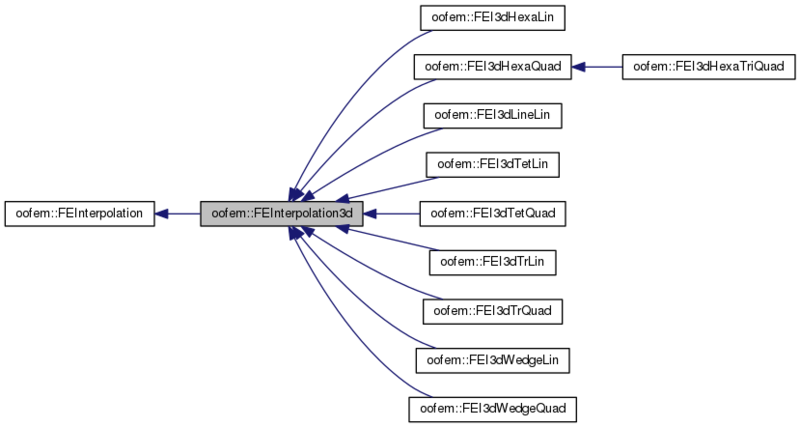 Reimplemented in oofem::FEI3dHexaQuad, oofem::FEI3dTrQuad, oofem::FEI3dTetQuad, oofem::FEI3dTrLin, oofem::FEI3dWedgeQuad, oofem::FEI3dHexaLin, oofem::FEI3dTetLin, oofem::FEI3dLineLin, and oofem::FEI3dHexaTriQuad. Definition at line 133 of file feinterpol3d.C. Implemented in oofem::FEI3dHexaQuad, oofem::FEI3dTrQuad, oofem::FEI3dTetQuad, oofem::FEI3dTrLin, oofem::FEI3dWedgeLin, oofem::FEI3dWedgeQuad, oofem::FEI3dTetLin, oofem::FEI3dHexaLin, and oofem::FEI3dLineLin.